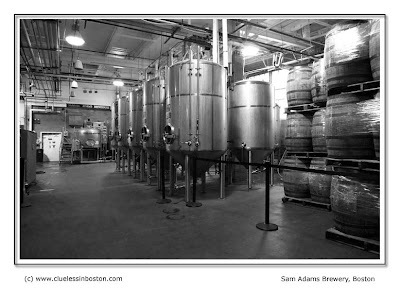 Main brewing room floor of the Samuel Adams Brewery in Jamaica Plain. You can see some of the vats used to process the beers and the specialty beers aging in their wooden casks. The small brewery in Boston is used for brewing some of their specialty beers; they have other breweries are in Lehigh, Pennsylvania and Cincinnati, Ohio. 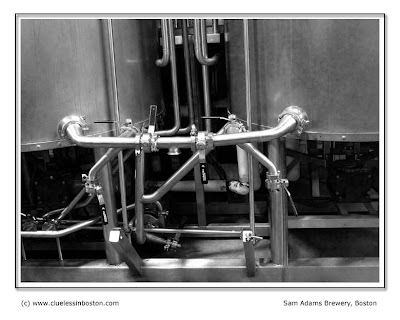 Close up view of the beer vats below. I am strangely drawn to the image, on a professional level, the wonderful tones and textures and of course the contents it holds. I've jumped from that great portrait of your son to here - both B and W and both super. I like both of today's but somehow the detail in the second really appeals. Bet the smell was great here! excellent photos. very interesting contrasts and detail. I am glad you enjoyed the pink Chihuly glass art on my site, as well as the door. Sorry I am behind on comments as I am traveling in Morocco so the sites and sounds here are a definite distraction. I have now moved to Frank Lloyd Wright's Taliesin West series over the next few weeks, which has some interesting doors. I am glad to learn you like taking photos of doors. You have had some great ones on your site. Thank you for this very interesting and unique captured details from brewery interior. What an interesting post!Your pictures are fantastic and I need to taste this beer.In fact I have never tried it. These are perfect choices for B&W. All that steel, yet my eyes are drawn to the barrels. Are they really wood? I've been on this tour several times. I love having it right in my JP neighborhood. Superb. I'm glad to see where my favorite beer comes from! Thanks for the extra info, Clueless. Fascinating. Especially the part about the maple syrup. Don't know if my taste buds are cultivated enough for that brew, though. PS. I'm jealous that you've tasted a clove lifesaver! My favorite beer! I toast to this post. I'm glad I strolled back & caught this one. Very interesting post. Nice shots.